ThermalTake officially introduces the Level 10 M Mouse, a new peripheral designed in cooperation with BMW's DesignworksUSA design studio. 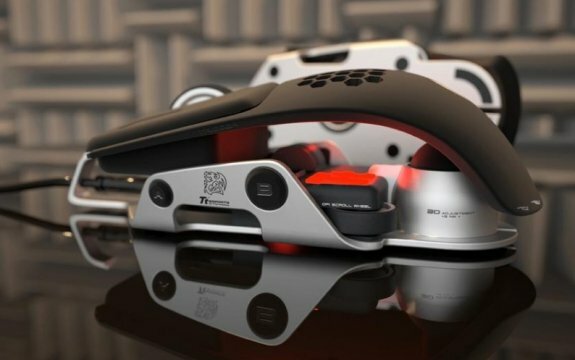 With the joint launch of the Level 10 M Mouse at CEBIT, Thermaltake Group and DesignworksUSA, the design subsidiary of the BMW Group, will demonstrate their idea of how to “Change The Game Through Design”. Continuing the dedication in perfecting the best gaming products, Tt eSPORTS, the subdivision of Thermaltake has made it one of their priorities to deliver the best design quality to enable their customers to maximize their gaming experience. To create the “Level 10 World of Gaming”, Thermaltake Group in year 2009 chose a design partner who understood the importance of creativity and could appreciate Thermaltake and Tt eSPORTS’ passion for gaming. The award-winning Level 10 chassis was a legend in the world of PC gaming, and now in 2012 the “Level 10 World” will be extended by a range of gaming peripherals with the M Mouse being the first product to be revealed. It will be pr! esented jointly at CEBIT and the teams will give insights into the design and development phases and the thinking that led to the creation of the final product. 3D Steering Axis Movement: The Mouse is divided into lower and top part which seems to float over the base. This part which is also the essential steering element of the mouse can be adjusted in regards to height and angle. The 3D dimensional character of the mouse provides for new and highly sufficient axis movements in various directions and makes the mouse fit as many gamers’ preferences as possible. Air-Through Ventilation System: Thermaltakes’ ventilation solutions made possible the sandwich design of the top and lower part creating a hollow, open structure that lets the light, the air as well as the surrounding travel through the product almost creating the feeling of a 4th dimension. Additionally the Mouse is fitted with exquisite texture - a perforated surface which provides for a better air and temperature exchange as a means of passive ventilation, solving issues due to heavy use and direct touch of gaming equipment and the rise of temperatures of the hand. Intelligent Software Application for customizing Gaming and Creative needs: The Level 10 M Mouse has it all: Programmable Keys, DPI Adjustability, Function-Lock Mechanism and more. It´s a programmable gaming mouse capable of using the most comprehensive software application to customize settings based on user's needs. The Mouse has two regular keys on top and five additional keys at the side. Each key is programmable by software application by a single press with the finger. The so called “Z” key is especially designed for five different commands. There is a total of eleven programmable command keys on Level 10 M Mouse while the “Z” key offers another function: During the gaming mode this key can switch between up to five gaming profiles. In addition, the polling rate and the seven lighting-effect colors of the Mouse are also customizable. The Level 10 M Mouse is equipped with 8200 DPI, adjustable from 800, 1600, 3200 to 5000 (default setting), and customiz! able by software application up to 8200 DPI. With clear indication on top of the mouse, users can observe the current DPI status and make change whenever necessary. The Function-Lock Mechanism also serves to avoid accidental error command by locking side keys during gaming mode. The Level 10 M Mouse is a tool which was clearly designed for pro-gaming and creative needs. The Level 10 M Mouse is available in three different colors: Diamond Black, Iron White, and Military Green. Each represents different characters and user’s unique personality, and each carries the gaming philosophy of Level 10. Level 10 M Mouse is an amazing gaming product that will truly revolutionize your gaming and aesthetic perception, joined by two great teams of Thermaltake Group and BMW Group subsidiary DesignworksUSA.